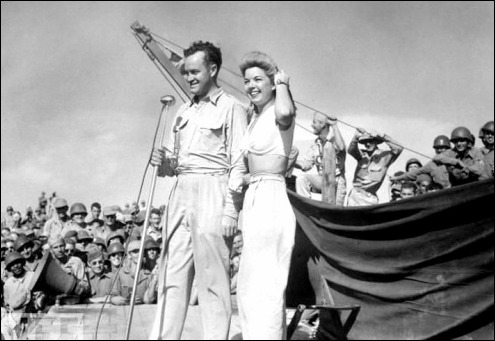 BOB HOPE & FRANCES LANGFORD ENTERTAINING THE TROOPS IN THE SOUTH PACIFIC. Radio’s D-Day. The most historic broadcast in history began in the midnight hours of June 6, 1944, when most of America slept. Wire services began flashing the bulletins at 12:37 a.m. ET, citing German sources which reported that the long awaited Allied invasion of Europe had begun. Radio Berlin immediately began a running account of the early paratroop landings and bombardment of the northern coastal areas of France. Unlike Pearl Harbor, the networks had months to prepare for D-Day. When it finally came - even in the dead of night - they were fully staffed and ready. Aware of a false alarm dispatched by the Associated Press two days earlier, the network newsmen cautiously cited enemy shortwave as their source of information. Finally, after three hours of winging it with German reports, shortwave confirmation came from General Eisenhower’s headquarters in London that the invasion was indeed underway. Then the networks went about the business of describing the 5,000 vessel armada crossing the English Channel with 150,000 Allied troops headed for the beaches of Normandy. A Big Tax Break. Commercial radio had its biggest year since 1937 - both the entire industry and the networks enjoyed over a 20% gain in revenues. The paper rationing that limited newspaper and magazine advertising was only part of the equation leading to broadcasting’s record revenues. The Internal Revenue Service ruled that monies spent on advertising were deductible from an excess profits tax imposed for the duration. Advertisers were given a choice - spend it or send it to the government. Most chose to spend it. As a result of the spending spree, two previously unsold network series were sold for more than a million dollars each. U.S. Rubber paid seven figures for The New York Philharmonic’s Sunday afternoon broadcasts on CBS which had gone without a sponsor for 13 years. General Motors paid a million for The NBC Symphony’s concerts two hours later. With so much demand for network time, NBC was able to hang the Sold Out sign on its entire 7:00 to 11:00 prime time schedule at the beginning of the 1943-44 season. CBS wasn’t far behind to report a sell-out while Blue and Mutual both registered healthy gains. Blue’s 68% revenue increase in the first eight months of 1943 capped its year and a half of independence from NBC during which the castoff network had picked up 30 new affiliates and 20 new sponsors. Credit goes to Blue’s enthusiastic young president, 40 year old Mark Woods, who was an up and coming NBC executive when he was given the task of heading the new company. Woods had a vision for the WJZ anchored chain free from NBC control. Woods began to pattern Blue after Mutual - allowing the broadcast of phonograph records and transcribed programming, beefing up the news department, encouraging new low-budgeted programs, offering special discounts to advertisers and aggressively pursuing affiliate growth. Above all, Woods knew that his mission was to make Blue a profitable operation, attractive to prospective buyers. RCA’s asking price for the network was a high $12 Milion. At that price, Blue’s bottom line had to look good. The Candy Man Can! Edward J. Noble was only 30 when he and a partner bought the idea for Life Savers from a Cleveland candy maker in 1913. Thirty years and billions of Life Savers later, Noble’s business successes included ownership of WMCA, a popular New York City independent station. Like Mark Woods, Ed Noble saw Blue’s potential. He also confident that he could get the network for a lower price if he simply waited. Finallly, in the summer of 1943, Noble offered RCA $8.0 Million for the network and its three owned stations - WJZ/New York City, KGO/San Francisco and WENR/Chicago. (1) Sold! Under the FCC’s duopoly provision limiting owners to one AM station per market, Noble sold WMCA and took control of Blue in January. His first acts were to retain Woods as his CEO and sell a 12½ % interest in the network to Time, Incorporated. The 30 Day Bondbardment. Radio continued to devote more total time to selling War Bonds than any other single product. The second highest rating of the season was 44.4, scored on Monday, January 17, when Let’s All Back The Attack! was broadcast on all four networks at 9:00, preempting Lux Radio Theater, The Telephone Hour, Dr. IQ, Gabriel Heatter’s news and ventriloquist Paul Winchell. Attack was an hour-long kickoff to the Fourth War Loan war bond drive with a goal of $14 Billion. Suave Conrad Nagel hosted the movie and radio star gala with transcribed remarks from General Dwight Eisenhower and Admiral Chester Nimitz. A total of $65 Million worth of advertising time and space, was pledged to the drive by the broadcast, print and outdoor media. The 30 day campaign exceeded its goal by nearly 10%. As Seen On TV - But Not Heard. NBC and Philco were both pioneers in early television. The war had severely limited development of the medium, but the two companies accomplished the first publicized attempt to link two stations on May 25, 1944. WNBT’s signal from New York City was picked up by a relay tower in New Jersey and pushed on to Philco’s WPTZ in Philadelphia. In effect, television networking was born with the transmission - but it didn’t come without some labor pains. NBC’s Eddie Cantor appeared on television’s inaugural chain hookup and launched into a duet of We’re Having A Baby, My Baby And Me from his 1942 Broadway musical, Banjo Eyes. TV’s first “network” censors found the lyrics objectionable and cut the telecast’s sound midway through the song. The act embarrassed and angered both Cantor and Philco. In retaliation, Philco invited Cantor to appear on its Radio Hall of Fame show on Blue the following Sunday, May 28th. He did and sang the song in its entirety. King Comedy. The Top Five Network Radio programs in the 1943-44 season were comedies. Twenty-two of the season's Top 50 shows were comedies - a new high of 44%. Bob Hope, (above), led the parade of comedians who logged countless miles to entertain the troops at home and abroad - and sell War Bonds to the civilian population. Wartime brought out the need for the diversion and healing of laughter and Network Radio was there to provide it. Once In 120 Months. Sunday’s Top Five - Edgar Bergen & Charlie McCarthy, Jack Benny, Walter Winchell, Take It Or Leave It and Fred Allen - finished in the same order as the previous season. It was the first time in the dozen years since ratings were first published that any night’s Top Five repeated in order from one season to the next. The same names would continue appearing in Sunday’s top tier of programs for the next three seasons with one notable exception, Fred Allen. Allen’s Ills. Fred Allen wasn’t a well man. His high blood pressure led to heart problems in 1943 and delayed his return from “summer” vacation until December. Texaco covered the 9:30 timeslot on CBS with tenor James Melton and a half hour of light classics and standards. The substitute Texaco Star Theater registered a meager 8.5 rating in early December. In contrast, Allen’s homecoming show later in the month scored 20.4, his highest rating in five years. He went on to enjoy his best rated season since 1939-40. But by June, the responsibility of writing and starring in the weekly show took its toll again. Doctors ordered Allen off the air for the entire following season during which Melton would again deliver single-digit ratings. Fred Allen never returned to CBS..
Doctoring The Ratings. Network stars commonly appeared in films - it was good for the box office and for ratings. But film producers seldom took the chance of basing a movie on an also-ran radio property - until Crime Doctor came along. Philip Morris established Crime Doctor on the CBS Sunday schedule in 1940 where it remained for seven seasons at 8:30 p.m. ET. The first three seasons were an uphill fight against the NBC favorite One Man’s Family which benefited from Edgar Bergen’s powerful lead-in. During the period Crime Doctor’s title role had been handed down from Ray Collins to John McIntyre to Brian Donlevy - all returning only single digit rating results. Then, in the summer of 1943, Columbia Pictures released the first in its series of ten Crime Doctor movies, low-budget film noir mysteries starring Warner Baxter as the psychologist/detective. The movie and its first sequel in December gave the radio series the promotional push it needed - a 40% ratings increase into the first of three consecutive Top 50 seasons. Six months before the first film’s release, Crime Doctor’s radio role was given to Mercury Theater veteran Everett Sloane who shared in the show’s newly found popularity for its final four seasons. If A Ford Can Afford It... Auto magnate Henry Ford had a soft spot for Greenfield, Michigan, his home town. This was no more evident than when Ford Motors bought 15 minutes on Blue’s Sunday night schedule to present the Greenfield Chapel Children’s Choir. The company had bought weekday and Sunday time for the hymn singers beginning in 1937. The question was if they were ready for prime time - opposite Edgar Bergen & Charlie McCarthy at 8:00. Blue Loses Voice In Divorce. Blue lost a dependable weeknight Top Ten program when NBC took full custody of Lowell Thomas in January during Blue’s transition from a co-owned to a competing network. Between his nightly newscasts and twice weekly narration of Fox Movietone newsreels, Thomas had one of America’s most familiar voices. Although his program was already broadcast by a number of NBC affiliates in scattered markets, his departure formally ended a 13 year association with Blue. It also marked the first time that Blue had been totally shut out of a weeknight’s Top Ten. Thomas joined some heavyweight company. Top Ten hits Jack Benny, Fibber McGee & Molly, The Aldrich Family and Mr. District Attorney - plus a host of other programs from Information Please to The National Barn Dance - who were all alumni of Blue and graduated to the more powerful NBC. With Thomas gone, Blue was left with only two Top 50 programs for the season - Walter Winchell’s Jergens Journal and Duffy’s Tavern - and one of those would leave for NBC the following year. It Takes A Pun To Know One. Stripped by NBC, the new Blue was scrapping for new programming and began experimenting with weekly half hour shows at 7:00 p.m. to counter the 15 minute Multiple Runs offered by the other networks. Interspersed with pop tunes from his Musical Knights band - formerly the Heidt Brigade - the enthusiastic Heidt interviewed Armed Forces veterans who had received early discharges - often from wounds suffered in battle. With their life and war stories told, attempts were made to solicit jobs for the vets from employers who were listening and inspired to call the program. Not many employers were listening - or anyone else. ​Heidt Time For Hires was buried in the ratings. Adding to the show’s troubles, two of the featured “GI’s back from the war” were phonies who had lied their way onto the program before its producers had the opportunity to check their stories..The show left the air after a year, but comeback king Heidt would return two years later with his biggest hit of all. Filling The Hope Chest With Cash. Lever Brothers bought Chicago toothpaste manufacturer Pepsodent and inherited sponsorship of Bob Hope’s top rated program. Hope's Pepsodent Show led Tuesday's Top Ten that included six comedies. Always the opportunist, Hope negotiated a new contract that paid him $15,000 a week to deliver the show. The comedian reportedly netted over half for himself. Lever Brothers spent money to make money. With the highly budgeted Lux Radio Theater and Hope, the company had the Number One program on both Monday and Tuesday nights. And Lever had a surprise winner up its sleeve for Friday, as well. Maid To Order Laughs. Marlin Hurt was a 39 year old journeyman saxophonist, vocalist and sometimes character actor in late 1943 when he caught Don Quinn’s ear. Quinn was continually scouting for new characters to drop into his Fibber McGee & Molly scripts. World War II service had removed Bill Thompson and Gale Gordon from the cast and Quinn needed fresh foils for Fibber. Hurt had the unique ability to switch his voice into a totally believable, throaty and jovial falsetto shaded with a stereotypical Aunt Jemima dialect. His character was introduced to the show at mid-season as Beulah, the McGee’s maid - never explaining how the McGee’s could afford a maid. Uncle Miltie - Tuesday’s Poor Relative. Milton Berle was only 35 but a 20 year veteran of show business and still looking for his big break. He had starred in two low-budget 20th Century Fox mystery-comedies in 1942, Whispering Ghosts and Over My Dead Body. But Berle is best remembered in films as the hero’s wisecracking sidekick with names like Frosty, Nifty and Lucky. His radio career had followed suite with a mediocre resume that included 1936's Gillette Community Sing and the short lived Stop Me If You’ve Heard This One in 1940. When Blue began experimenting with weekly half hour programs at 7:00 p.m. ET, Eversharp bought a new concept starring Berle, Let Yourself Go. The pen and pencil manufacturer was riding high with Sunday’s hit, Take It Or Leave It and was a believer in the comedian-hosted audience participation format. Unfortunately, Let Yourself Go was no Take It Or Leave It, and Milton Berle was no Phil Baker. Go’s format invited contestants and celebrities alike to fulfill a fond desire - the sillier the better - and hopefully make fools of themselves in the process. Guest stars over the show’s first weeks included movie character actors Ned Sparks, Roland Young and Patsy Kelly - hardly big name guests. The best rating Berle could deliver with the absurdity was a lowly 3.0 - on the same night that his contemporaries, Bob Hope and Red Skelton, were racking up 30's. Berle’s attempts to compete for Tuesday’s radio audience with Let Yourself Go was a dismal failure. Ironically, Berle returned to Tuesday night four years later with television’s Texaco Star Theater. TV made him the hottest comedian in show business and he stole Network Radio listeners by the millions. Judy Punches In. Gardner’s wise-cracking, big city sitcom was programmed against a new, similarly structured sitcom on CBS with a completely opposite setting and appeal. Judy Canova was a pig-tailed 30 year old who had years of stage experience, a dozen movies and scores of radio guest appearances to her credit when her own show was scheduled on CBS in 1943. A singer/comedienne given to both ballads and yodeling, Canova became known as “The Queen of The Hillbillies” from her films. The Judy Canova Show, a rural sitcom with music, shot immediately into the season’s Top 50 and stayed there for nine years. After her first season’s success, sponsor Colgate packed up the show and moved it to NBC - where former competitors Judy Canova and Ed Gardner both became part of the network’s comedy monopoly. Sinatra’s Double Sided Hits. CBS always had an ear for young singers. It had nurtured Bing Crosby and Kate Smith to radio stardom in the early 1930's, then caught Frank Sinatra at the height of his “bobby-sox” popularity in 1943 when American Tobacco made Sinatra the star of Lucky Strike’s Your Hit Parade with immediate ratings success. Less than two years after leaving the Tommy Dorsey band for a solo career, the 28 year old Sinatra was given his own Wednesday night variety show on CBS as the mid-season replacement for Mayor of The Town, starring screen legend Lionel Barrymore, 66, which was nudged over to the network’s Saturday schedule. Sinatra’s first month on the air attracted 50% more audience than the aging Barrymore could muster. The singer was on his way to accomplishing a rare feat - starring in two Top 50 shows simultaneously in the same season. Bonding With Listeners. Despite Sinatra’s success with CBS, his Wednesday competitor on NBC at 9:00, Eddie Cantor, attracted almost 40% more audience. Cantor, 52, proved that he still had his energy and a persuasive pull with listeners by executing a memorable stunt in early 1944. At 6:00 a.m. Saturday, January 29, 1944, Cantor began a 33 hour marathon broadcast from NBC’s KPO/San Francisco. It was a big show, complete with a full orchestra and backup singers with the sole objective to sell war bonds. Cantor’s broadcast originated from a theater with seating for a rotating audience who purchased war bonds to attend an hour’s portion of the show. Over 17,000 bonds were sold as his fans flocked in to see Cantor sing, dance and joke with the crowd over the long stretch. But that was just a trickle compared to the flood of response that flowed from the KPO listening audience. When all bond sales resulting from the broadcast were tallied, they totaled an astonishing $40 Million. A Rare Medium? Well, Dunninger... Joseph “The Master Mind” Dunninger - once known on the vaudeville circuits as “Master Joseph Dunninger, Child Magician” - toured the nation’s theaters and night clubs with a popular mind reading act. The 50 year old jack of all illusions offered a $10,000 reward to anyone who could prove that he employed plants or accomplices of any kind as he surveyed his audiences and dramatically related answers to questions they had secretly written down which allowed him to, “Lock into their thoughts.” . Rudy Who? Joan Davis made sponsor Sealtest Dairies forget Rudy Vallee. With Wizard of Oz “Tin Man” Jack Haley as her co-star, Davis held her own in the strong NBC lineup with her newly formatted Sealtest Village Store sitcom. Davis and Haley pushed their way into the season’s Top Ten, something that Vallee was unable to do in his three years of Sealtest sponsorship. It was the first of two Top Ten and four Top 50 seasons for the comedienne. The Big Comeback. Freeman Gosden and Charles Correll staged the fastest and biggest comeback in Network Radio history. When Amos & Andy finished its weeknight quarter hour run on CBS in February, 1943, the two radio veterans quickly went to work reinventing their format. The cozy little two man studio show was out - replaced by a slick weekly sitcom performed before an audience with a stage full of actors and musicians - almost all of them black performers. Amos & Andy was suddenly a major production with a staff of writers, producers and directors. Sinatra Leads The Parade. Your Hit Parade’s twelfth season was its best ever. Frank Sinatra joined Lucky Strike’s weekly countdown of pop music hits during the previous February as its co-star with Joan Edwards. His presence became felt in 1943-44 when the program broke into the season’s Top 20 for the first time in nine years. It stayed there for two seasons - until Sinatra left. The singer was just eight years removed from his first radio appearance on Major Bowes’ amateur show in 1935 with the Hoboken Four quartet. His rise through the Harry James and Tommy Dorsey orchestras into a shrewdly managed solo career paid off in a reported 1943 income of $100,000, (1.3 Mil. ).Sinatra’s first starring film, RKO’s Higher & Higher, was released in December and his crooning its Oscar-nominated I Couldn’t Sleep A Wink Last Night was a smash with his bobby-sox following. As a result, Your Hit Parade featured Sinatra singing his own hit song every week in early 1944. Mr. Ford’s Music For Squares. Henry Ford’s heavy foot stepped on the toes of J. Walter Thompson when his new ad agency signed Tommy Dorsey’s popular orchestra for a 13 week Saturday night series on Blue. The auto magnate wanted nothing to do with the “Devil’s Music!” that he branded Dorsey’s brand of swing. Ford had his Sunday night hymns from Blue’s lowly rated Greenfield Chapel Children’s Choir. He determined to have “his kind” of music on Saturday nights, too - music for square dancing. Early American Dance Music featured The Ford Early American Dance Orchestra - a dulcimer, a cymbal, a violin and bass - plus a “caller” for those dancing along at home - which probably included the entire Ford household but not many more. It was among the season’s lowest rated programs. Objectionable Objectivity. World War II was raging on both the European and Pacific fronts. Understandably, five of the highest rated Multiple Run programs of the season were 15 minute newscasts - H.V. Kaltenborn, Lowell Thomas and John W.. Vandercook’s News of The World from NBC and Mutual‘s Gabriel Heatter and Fulton Lewis, Jr. CBS was conspicuously missing from the list. The World Today with Joseph C. Harsch - the former CBS Rome and Berlin correspondent - could only muster a third of Lowell Thomas’ ratings on NBC when the two were pitted against each other at 6:45 p.m. ET. The CBS promotion department went to work attempting to elevate its news department’s image with a full page ad in metropolitan newspapers. The ad proclaimed that neither CBS nor its newscasters and commentators would ever express editorial opinion. Responding for his Association of Radio News Analysts, NBC’s H.V. Kaltenborn expressed outrage by saying, “No newsman worth his salt could or would be completely neutral or objective!” Taking the offense personally, CBS newsman Cecil Brown quit the network. Brown was the voice of the network’s nightly Johns-Manville News which CBS had smartly carved out of its prime-time programming every night at 8:55. Brown left for Mutual where he would remain for the next dozen years and the CBS ad was never seen again. (1) WENR shared time on 890 k.c. with WLS until the two stations merged in 1960 and WLS became the surviving call sign. (2) KECA became KABC in 1954 when ABC bought the call sign from a Houston station. C.E. Hooper Semi- Monthly Reports, Sep, 1943 - Jun, 1944. Total Programs Rated 6-11 PM: 188 Programs Rated 13 Weeks & Ranked: 183.